Below are some of our most used site links to provide you some additional information. Also, check the manufacture's list on our equipment page for links to their sites. DiveAssure makes available to the recreational diving community insurance protection during diving activities. GAP-Software, the source for decompression and table generation software. If you are a recreational diver or an advanced technical diver, GAP-software has the the decompression software for you. Models including RGBM, Buhlmann with gradient factors, Mf11 are available. Platforms are either Windows or Pocket PC. Of course Closed Circuit and Open Circuit is supported as well as metric and imperial units. NOAA site contains real-time information on tides, air and water temperatures along the pacific coast. 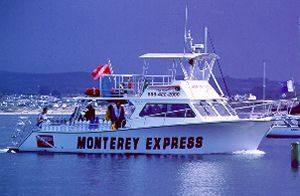 Explore the beauty of nearby Monterey Bay diving from the "Monterey Express." Comprehensive updated information about diving and undersea medicine for the non-medical diver. Lake Tahoe vacation rentals from Vacation Station. Providing Lake Tahoe vacations and vacation rentals for the North Lake Tahoe Incline Village area. Great source for reference information in the research archives.